7:30 First Dining, First Booths, Mezz Booths & West Rail SOLD OUT! 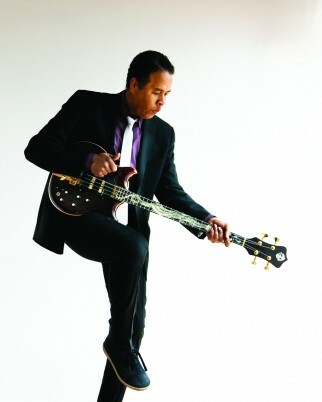 Click here to read our interview with Stanley Clarke! STANLEY CLARKE is one of America’s most famous and influential jazz bass players. In 1971, fresh out of the Philadelphia Academy of Music, he arrived in New York City ready to play. He immediately landed jobs with Horace Silver, Dexter Gordon, Art Blakey, Stan Getz, Chick Corea, and scores of other greats. Clarke’s skills were immediately recognized, and it wasn’t long before he and Chick Corea formed the electric jazz/fusion band Return to Forever. The group released eight albums that garnered critical acclaim and mainstream popularity. Two albums were certified gold, one won a Grammy, and others received countless nominations. As he was playing with Return to Forever, Clarke also released several albums under his own name, and continued to boost his solo career. Clarke is credited with starting the “bass revolution” of the 1970′s with his percussive slap funk technique. His solo album, School Days, is one of the most influential solo bass recordings in history. Stanley Clarke became the first bassist in history to headline tours, selling out shows worldwide, and have his albums certified gold. The word “legend” was used to describe Stanley by the time he was 25 years old. Alembic eventually honored Clarke’s pioneering of the instrument, and they offered a signature “Stanley Clarke” model bass guitar. That was the first custom built instrument Alembic made. In 1981 Stanley teamed with George Duke to form the Clarke/Duke Project. Together they scored a top-twenty pop hit with “Sweet Baby,” recorded three albums and still tour to this day. Stanley’s involvement in additional projects as leader or active member include: Jeff Beck (tour of Japan and Europe, 1978-1979), Ronnie Wood’s & Keith Richards’ New Barbarians (North American tour, 1979), Animal Logic (with Stewart Copeland, two albums and tours, 1989), The “Superband”(with Larry Carlton, Billy Cobham, Najee, and Deron Johnson, 1993-94), The Rite of Strings (with Jean Luc Ponty and Al Dimeola, 1995), Vertu’ (with Lenny White, 1999). Clarke not only made a name for himself playing bass, but he also scored several television shows, and worked as a composer, orchestrator, conductor, and performer for many films. Throughout the last decade, Clarke has continued to tour and perform with various musicians. Most recently, in 2010, he released The Stanley Clarke Band, which features Hiromi on piano. In 2011, he won a Grammy Award for Best Contemporary Jazz Album.